In the magazine the Pope is on the same page as Osama Bin Laden and Angela Merkel (which makes some sense). I can't help but wonder at the conversation that went behind putting him underneath those two. The picture they chose is a good one that caused one reader of this blog to ask, when Amy and I had posted the picture last year if it was a picture of George Steinbrenner. It was never going to be easy to follow a man like Karol Wojtyla, a "Technicolor" Pope, with his unmatched skills as a preacher and an actor. 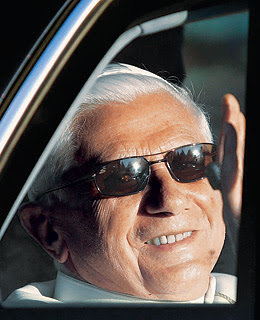 Everyone thought that when Joseph Ratzinger, 80, became Pope, the crowds in St. Peter's Square would greatly diminish and the mass interest in the papacy would disappear. But just the opposite has happened. And therein lies the enigma of Pope Benedict XVI: Why are the faithful (and others) drawn to an intellectual who concedes nothing to the show, who says difficult things (like his September speech about faith and violence in Regensburg, which touched off anger among Muslims), who doesn't bargain with the Gospel? What makes people rush to this fragile man who speaks softly and politely without moving his hands, without ever acting? Evidently, there is a sort of secret attraction, as if many can sense the fascination of the sacred through the witness of Benedict's thoughts and his modest and humble life. After the Slavic sentiment arrives German seriousness—different charismas that confirm that the Catholic Church knows how to make room for every kind of temperament, letting the human qualities of such different men shine through. Wow, what an amazing testimony to read from a venue like Time! I'm so glad to see this!